Pianist and composer Kris Davis has become one of the most active and accomplished musicians of her generation. Born in Vancouver, Davis began playing piano at the age of six, and studied classical music through the Royal Conservatory in Canada. She also spent part of her childhood in Brooklyn and resolved to become a professional musician after playing in the school jazz band at age twelve. She earned a bachelor’s degree in Jazz Piano from the University of Toronto and attended the Banff Centre for the Arts jazz program in 1997 and 2000. The pianist received a Canada Council grant to relocate to New York and study composition with Jim McNeely, and a second grant to study extended piano techniques with Benoit Delbecq in Paris. She holds a master’s in Classical Composition from the City College of New York, and she teaches at the School for Improvised Music. She formed her first group, a quintet, in 2002 with saxophonist Tony Malaby, trumpeter Russ Johnson, reedist Jason Rigby, bassist Eivind Opsvik, and drummer Jeff Davis. By 2006, the group had become a quartet with Malaby, Opsvik, and Jeff Davis. In 2011, Davis released her first solo record, Aeriol Piano, which appeared on the Best of the Year lists of the New York Times, JazzTimes, and the Art Forum. 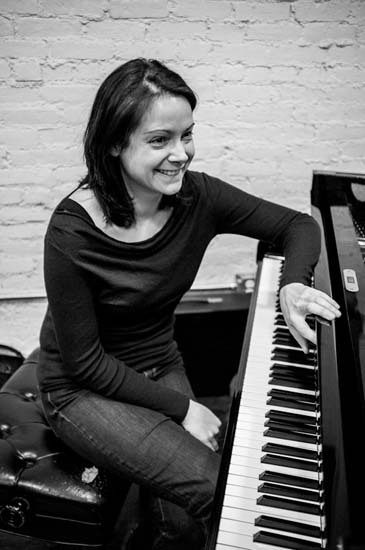 She has also been featured as an arranger for Tony Malaby’s nonet project Novela. The pianist is also a member of the collaborative Paradoxical Frog with tenor saxophonist Ingrid Laubrock and drummer Tyshawn Sorey; their 2011 self-titled record appeared on the Best of the Year lists by National Public Radio, New York Times, and All About Jazz. In 2012, she formed a new quintet with Laubrock, violist Mat Maneri, bassist Trevor Dunn, and drummer Tom Rainey. In addition to her work as a leader, Davis has performed with such figures as Paul Motian, Bill Frisell, Tim Berne, John Hollenbeck, Michael Formanek, and Mary Halvorson. Most recently, Davis received a commissioning residency to write for her trio with Rainey and John Hébert from the Jazz Gallery, and the Shifting Foundation awarded her a grant to compose and record a large-ensemble project.